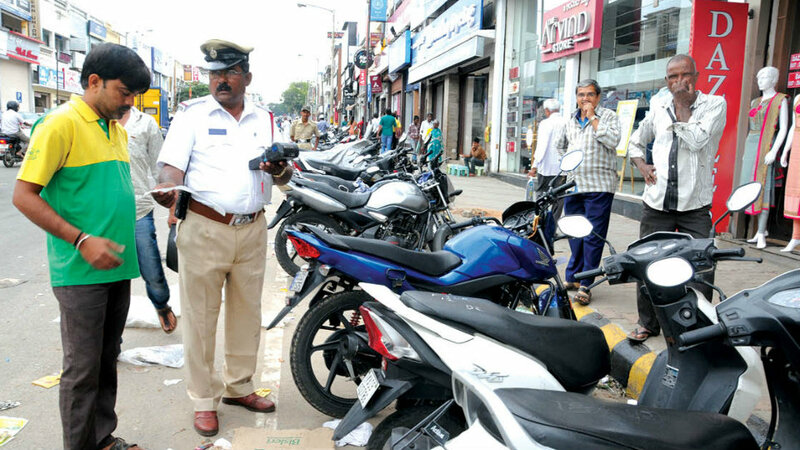 Mysuru: The City Police, who have launched a special drive to collect fines from traffic rules violators who have been trying to evade the same ignoring the notices sent to the owners of such vehicles, have collected a fine amount of Rs. 14,74,500 from 14,456 traffic violators on the first two days of its launch. The drive has been launched to book offenders who have not responded to Field Traffic Violation Report (FTVR) notices sent to them to pay fines. The fine amount is expected to increase further with the Police personnel continuing their drive. According to a press release, the Police launched a drive to collect fine from those booked under FTVR, under which the violations were captured by the CCTV cameras installed at traffic junctions in the city and those recorded by the Policemen on duty. However, even after the FTVR notices were sent to the address of the vehicle owners, majority of them have not paid heed to the same. Following this, DCP (Crime and Traffic) Dr. Vikram V. Amathe directed the Policemen to send the jurisdictional personnel to the houses of the violators and collect the fine amount from them. In addition to this, random drives are being conducted and vehicles, irrespective of parked and moving, should be intercepted and checked for pending cases if any. If there are any case, fine should be collected on the spot and the vehicle should be seized in the case of any failure to remit the amount. Police Commissioner Dr. A. Subramanyeshwara Rao has also advised the violators who have been continuing to evade paying the fine amount at the nearest Police stations.